SMMEs must be empowered to tackle the country's triple challenges of unemployment, poverty and inequality. So says the Ithala Development Finance Corporation (Ithala), KwaZulu-Natal's provincial development agency, which is intent on contributing to government's current objective to promote radical economic transformation. The National Development Plan's vision by 2030 is to achieve long-term accelerated economic growth whilst also reducing unemployment and inequality and helping to create a more inclusive society. Hence, the ever-increasing role of state-owned development finance institutions (DFIs) in promoting job creation, shared economic growth and expansion of infrastructure as outlined in SA's Growth Path Framework is imperative. As a development finance institution, Ithala has an obligation to create an environment conducive to growing small businesses and to ensure knowledge and skills transfer in the interests of business sustainability. SMMEs have a high labour-absorptive capacity and hold the key to unlocking local economic development. Hence, the state, corporate and private sectors must collectively share the responsibility of building a solid foundation for SMMEs to thrive. In the past three years, Ithala has funded 684 business. The organisation disbursed R875 million, creating 7917 jobs. Women-owned enterprises comprise 28% of Ithala's loan book while youth businesses are 39%. Three flagship programmes spearheaded by Ithala are aimed at improving the long-term sustainability of SMMEs in KZN. The Inkunz'isematholeni Youth in Business competition attracts youth from all over KZN with innovative and sustainable business concepts, providing incubation and start-up support in their journey to becoming seasoned entrepreneurs. Since 2014, over 300 participants have been reached. Intensive incubation programmes are in progress with 20 candidates. "Imbokodo Iyazenzela" or "Women doing it for themselves" is an outreach programme that has enhanced the knowledge and skills of over 2400 women in 16 towns of the province in collaboration with several strategic partners. "Siyasebenza" which means "We are working" is a business development programme aimed at educating existing and emerging entrepreneurs on ways to build and grow sustainable businesses. Over 2000 SMMEs in all 11 districts of KZN have been reached. Ithala was declared a finalist in the Vision 2030 Awards in the Industrial Action Plan Award category in recognition of the organisation's commitment and significant contributions to moving the nation forward, as a leader in the sector and as a proponent of the National Development Plan. 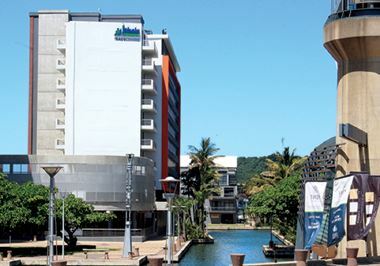 Ithala is the second largest property portfolio holder in KZN with over one million square metres of industrial and commercial space and a pioneer in the development of commercial centres and industrial estates in rural areas. Isithebe, Ezakheni and Madadeni Industrial Estates are owned by Ithala and operate across a myriad of industries. Collectively, the estates have created over 40 000 jobs, affording up to an estimated 300 000 people in regional areas a livelihood. "Our capacity-building programmes combine both financial and non-financial support which we believe are crucial to spurring economic development. We therefore, take seriously our role to impact the lives of the people of KZN." Ithala SOC Limited - a 100% owned subsidiary of Ithala, has received overwhelming government support to achieve state bank status. This is in line with government's strategy to transform the financial sector, empower communities and accelerate radical economic transformation. Ithala SOC Limited is well on its way to obtaining a full banking licence during 2017 and becoming a fully-fledged bank. To be the catalyst for growth, economic development and empowerment. To drive economic development and empowement, whilst remaining financially sustainable.